It has happened! The thing that all yarn crafters fear has happened to me! I have hand and arm pain! 🙁 I have been pretty lucky so far, considering how much I use my hands for typing, mousing, manipulating my smart phone, and of course crocheting. 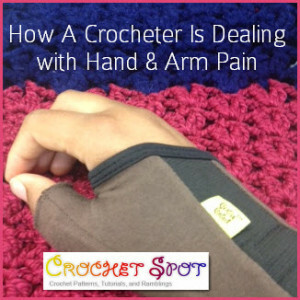 Since there is an abundance of information about crafter’s hand and arm pain on the web, I’m going to outline the steps I am personally taking to deal with my own problem. Needless to say, I am not a doctor, and this is not meant to be medical advice. My pain is in my right hand, mostly between my thumb and forefinger. It extends to my wrist and is also sometimes shooting up my forearm. Boo! For a few days I couldn’t use my right arm to do a lot of things like holding anything or operating the computer or smart phone. Of course I have also been unable to crochet in the normal way.